Welcome to the April issue of WW magazine. We love this time of year, so we’re making the most of it! Inside, you’ll find recipes bursting with colour and flavour, inspirational success stories, and much more to get you excited about the new season. Feeling like you need to spring clean your life? Take a tip from WW Member Georgie, who’s overcome anxiety, developed new healthy habits, and lost an incredible 10st. We also meet Stephanie, an American-born member who, since moving to the UK, has learned to love exercising outdoors. Then there’s Adam, a formerly unfit dad who challenged himself in the boxing ring. If that wasn’t enough motivation to reboot your healthy routine, we also catch up with three members who share how the animals they love have enriched their lives. In spring, there’s one big event on our minds – Easter! 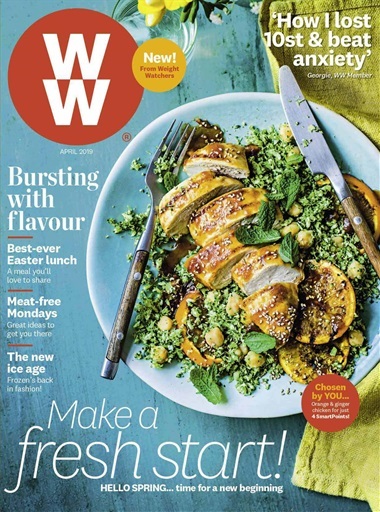 That’s why we invited WW Member Sue to share her favourite seasonal recipes, including lamb steaks with sticky carrots, which are perfect for the occasion. You’ll also find our delicious cover recipe, a gorgeous flourless chocolate cake, and a handy meal plan inside. Plus, we have colourful flatbreads to suit all tastes, whether you’re veggie, vegan or reducetarian! Start spring in style with fashion expert Sophie’s picks of this season’s biggest trends, and beauty expert Bryony’s glow-boosting buys. Plus, read how eating with others could benefit your health, give meditation a go, and find expert advice and tips from our panel of health and wellbeing pros.